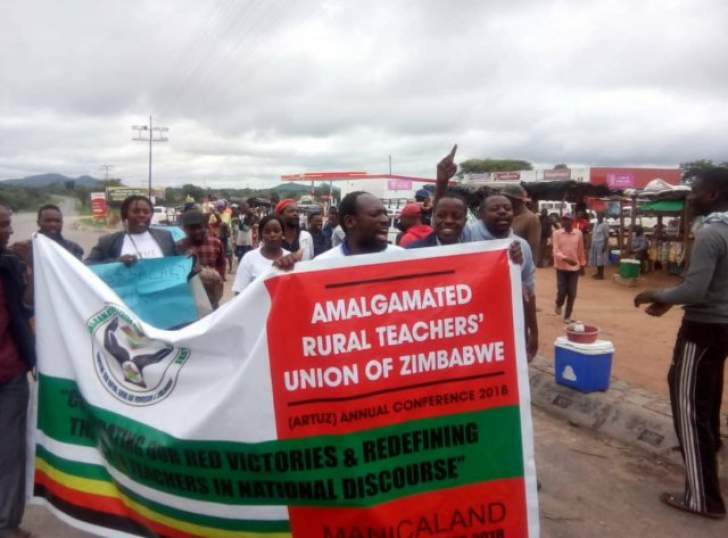 The Amalgamated Rural Teachers' Union of Zimbabwe (ARTUZ) have rejected a salary increment deal signed between the government and the APEX Council. The media reported that an agreement signed by the government and the top public workers' union Apex Council said: "a cost of living adjustment of RTGS$ $400 million (will) be effected across the board for all members of the public service with effect from 1 April." In A statement ARTUZ said, "We note with disgust the flawed deal signed between the government and the illegitimate and highly compromised APEX council. "The deal offers a meagre US$ 26 salary increment to the current US$ 120. In total, an average teacher will be earning the US $146 in April 2019. This falls far short of US $1 150 needed to sustain a family of 5 monthly." ARTUZ encouraged the government to revert to the 2012 agreement signed with civil servants. "ARTUZ reiterates that government should simply honour our 2012 agreement and pay our current salaries in USD or equivalent. We reject the deal and we have no option but to take to the streets and withdraw our labour in due course." Meanwhile, ARTUZ Mashonaland West province has postponed its scheduled protest from 22 March to 29 March 2019. The association said the postponement has been necessitated by the need to collect donations towards the victims of cyclone Idai. ARTUZ mourns all who perished and stands in Solidarity with the surviving victims.